10, 20, or 30 round detachable box magazines. Also compatible with 40 round box magazines and 75-round drum magazines from the RPK. The AKM is a Soviet assault rifle that was designed by Mikhail Kalashnikov in the 1950s and adopted in 1959 by the Soviet army to replace the AK-47. 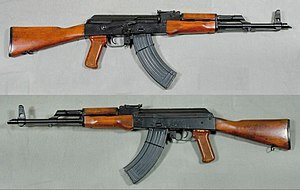 The difference between the AK-47 and the AKM is that the AK-47 is short and the AKM is long and the other difference is that the AK-47 has a regular muzzle and the AKM has a sharp muzzle. United States: Captured from Vietnam War. This page was last changed on 5 January 2019, at 09:23.